Check out these photos of our "home away from home". 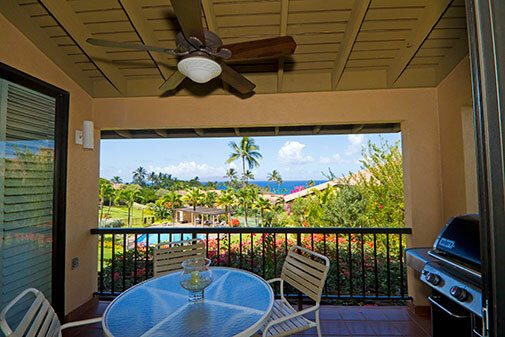 Just move your curser over any picture to learn more about our Maui Wailea View Condo. 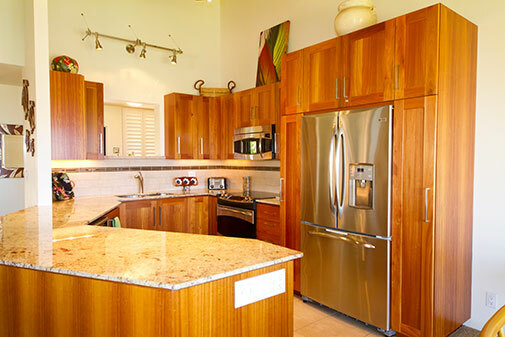 Wailea Ekahi 28D is a spacious two bedroom, two bath condo with a sweeping, close in ocean view. The pool below our condo, one of four in Ekahi Village, provides a calm, restful atmosphere. Whether we're working in the kitchen, eating in the dining room, or relaxing on one of our private lanais, we never tire of this beautiful environment. Our kitchen was a primary focus of our 2009-2010 remodel. We removed two walls, raised the ceiling, and added all new cabinets and appliances. We now enjoy an open, spacious and well stocked cooking and work area. The beautiful wood beamed ceiling above the dining table is also found on all the cathedral ceilings throughout the condo. This is something that truly sets our condo apart from the rest. Our newly created "great room" is perfect for entertaining friends, or just enjoying some TV time or a DVD movie on the flat screen TV. The convenient Weber gas grill on the lanai makes "cooking-in" a snap. We often have dinner on the lanai. With the pool below and the ocean spreading out beyond, the setting rivals that of any fine restaurant. We love dining on our main lanai. One of 3 out door living spaces that are part of our condo, this space opens to both the living and dining areas and has a Weber gas grill - great for easy island style meals. The well appointed master bedroom has a king bed. Its lanai overlooks the pool and ocean, and serves as a perfect location for either morning coffee or sunset cocktails. Hawaii is famous for its gorgeous sunsets. 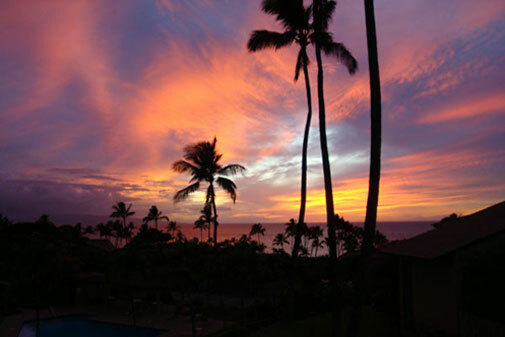 It doesn't get much better than this one, which was photographed from our master bedroom lanai. The master and guest dressing areas and baths were all newly remodeled. 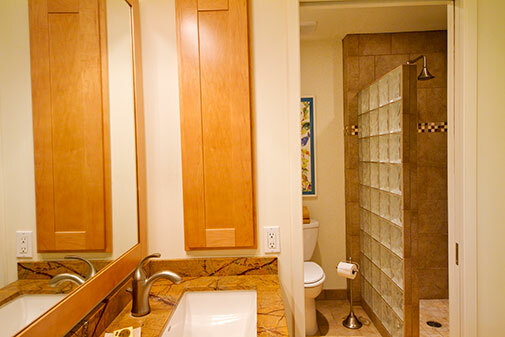 Each dressing area vanity contains plenty of drawer space so you can "spread out" during your stay. 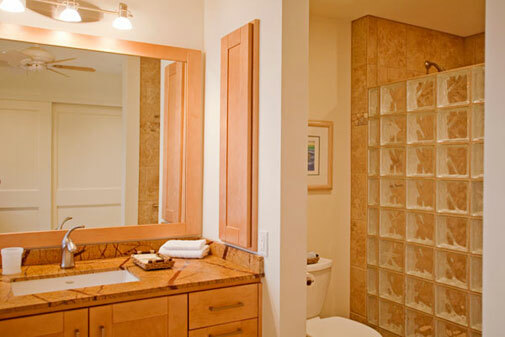 We especially appreciate the roomy, porcelain tiled walk-in showers. 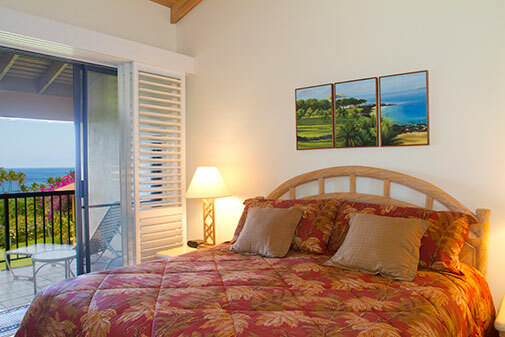 The guest bedroom and its adjoining lanai have a special, private atmosphere. In the morning, you awake to the unique sounds of Hawaiian birds. The lanai is enveloped by tropical foliage. 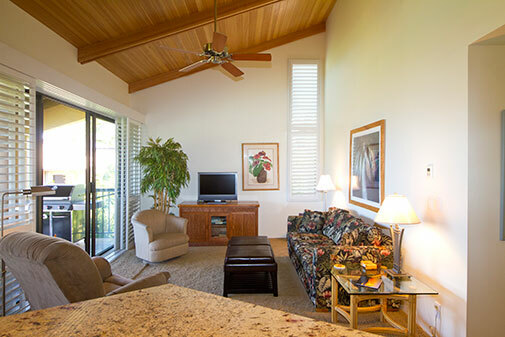 The guest suite is a great place to relax and unwind following an active day on Maui. The brightly lit, remodeled, guest dressing area and ensuite bath complete the comfortable guest suite. 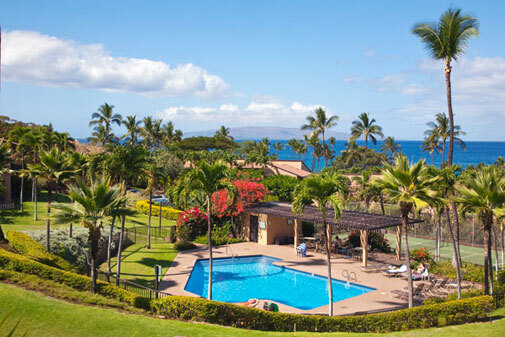 Wailea Ekahi is well known for its beautiful, well manicured grounds, tropical trees, and flowers. Color is everywhere, and the dark green palm fronds and multicolored bushes and ground cover contrast perfectly with the deep blue Hawaiian sky. Looking back up at our condo from the "quiet pool" below. 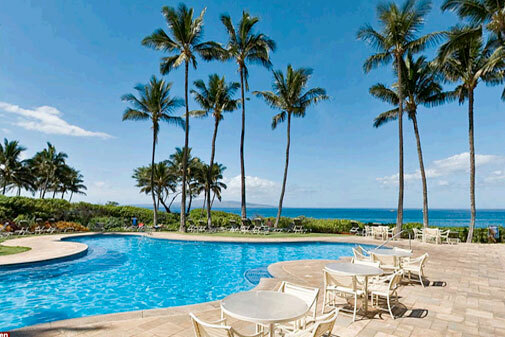 A brief walk from the condo brings you to Ekahi's ocean front main pool and pavilion. The pavilion includes charcoal grills, a well equipped kitchen, and tables for a beach front lunch or cookout. Ekahi's ocean front pool is heated and has a 3' shallow end with walk in stairs for the younger crowd. It is a popular spot to gather at sunset but we find the views from our condo are even better. Walk through Ekahi's private gate below the main pool and before you lies the expansive Keawakapu Beach. 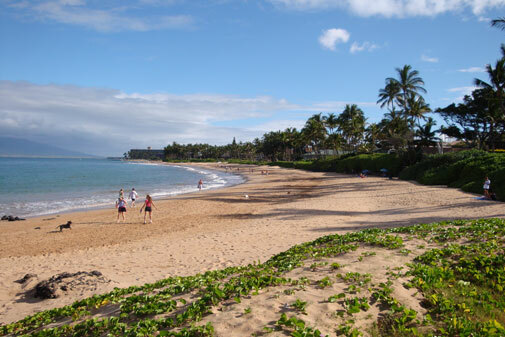 We spend hours here, either snorkeling, riding boogie boards, walking along two-plus miles of beach, or just sitting and soaking up some Maui sun. This floorplan was developed from our architect's drawing for our remodel. It may not be completely to scale but should help orient you. Aerial View of Ekahi. 28D has a perfect location for enjoying the grounds. 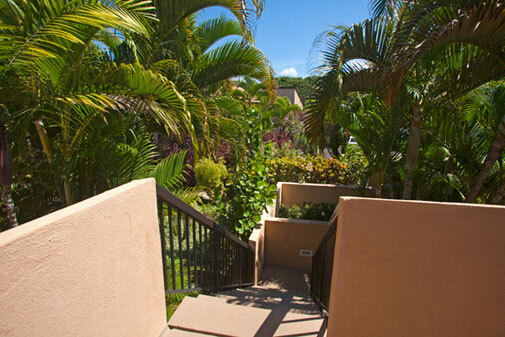 Read what our guests have to say about the view, remodel, location and other pluses of our Maui condo by owner rental. There is a King bed in the master bedroom, 2 Twins in the guest bedroom and a Queen sofa sleeper in the living room. "I will now have to renovate our home as my wife loves your kitchen." "We had a lovely time in your beautiful and well stocked unit." "This is our first trip to Hawaii. The view is wonderful, and your home is comfortable and lovely." "The Ekahi grounds are beautiful, and these are the best beaches we've been on!!" 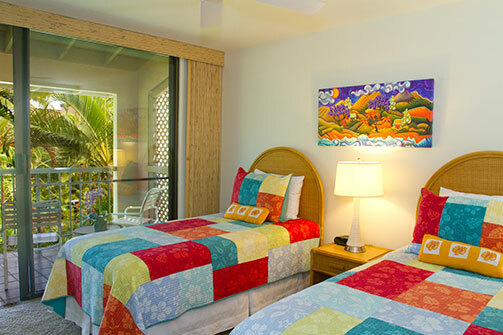 "Ekahi is a great place to stay! We enjoyed your condo, especially the view from the dining table!" We want your experience in our Maui home to be enjoyable and have tried to supply those little things that can make a difference. Please let us know if there is something we have missed. No need to bring bulky items like linens, beach towels, etc we are fully stocked for your stay. Same with a hair dryer - we have one in each bath. A front load washer & dryer in the condo makes it easy to travel light. If you want help cleaning up or something breaks, we have a housekeeper and handyman on island and on call! You'll find their numbers when you "check in". You'll enjoy the convenience of our Digital Wall Safe. Makes it easy to leave your valuables in the condo when going out to the beach. 3 room air-conditioning units and ceiling fans (6) in the kitchen, living room, each bedroom and each dressing area insure your comfort even when the trade winds aren't blowing. We love to dine outdoors and listen to the waves break on Keawakapu Beach. 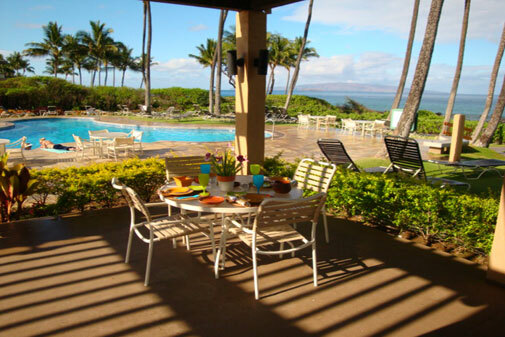 For easy Maui-style cooking we provide a Weber gas grill on the lanai, an extremely well-equipped kitchen with ice maker and several sets of table linens. My wife and I along with another couple just returned to the mainland after spending three fabulous weeks at Lynn & Sharon's condo. 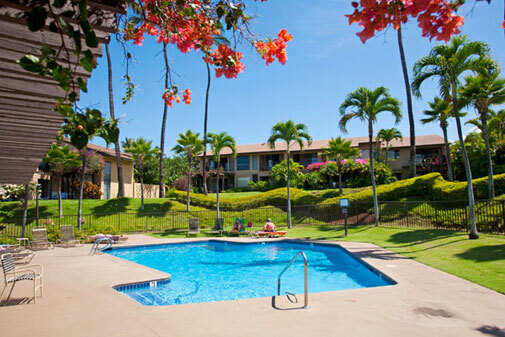 Their unit, 28-D, is located in the Wailea Ekahi complex. We've stayed at this complex on several different occasions, and in several different units, and this one is as good as it gets. Being in the real estate business, I know a good photographer can over-hype a property with great pics. The pictures on this site are great, however, they don't do 28-D justice. The interior of their condo leaves nothing to the imagination, and there isn't anything they don't have. You can leave your beach towels, beach chairs, coolers, boogie boards, wine openers, etc, etc, etc at home. To say the place is "well equipped" is a gross understatement. In fact, we all threw a dollar in a pot, and if you could find something the Peabodys didn't have in the unit, you'd win the pot! No one ever collected! They've also compiled an instructional manual, in binder form, that leaves nothing unaddressed. If you're wondering about anything, consult the manual before contacting Lynn or Sharon . . . you're more than likely to find your answer there! In closing, I must add that you won't find two nicer people to deal with than Lynn & Sharon Peabody, and we can't thank them enough for sharing their "home away from home" with us. With their permission, we will be returning to 28-D! Mahalo nui loa! With our family of six this was truly the first vacation where I came home refreshed! The Peabody's place is a well appointed and very clean condo providing A/C, quality beds (like seriously... we now want a new bed at home), linens, well-stocked kitchen, efficient dishwasher & laundry, cooler for the beach, beach chairs etc. to make it easy to get right to relaxing and exploring. 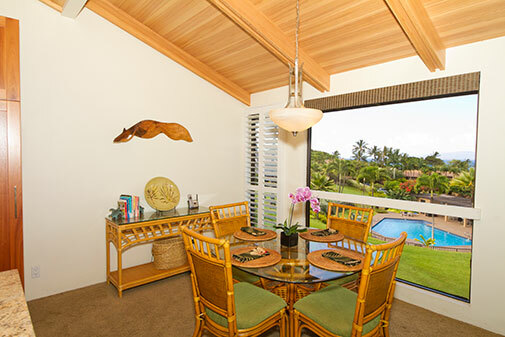 As residents of the Big Island for the past seventeen years we know what a visitor needs & this condo had it all! The morning view of Kaho'olawe & a cup of coffee before the family woke up was my time to treasure. The location of the condo is very convenient as we explored Lahaina, the road to Hana and Upcountry & Haleakala on separate days. The pools and covered areas were also very nice. As one of our sons was on crutches it was convenient to drive him to the oceanside pool and park. 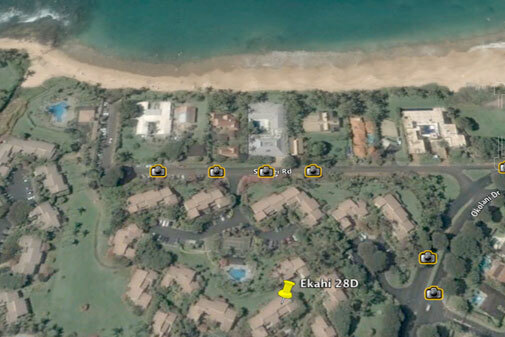 I highly recommend the location of the Wailea Ekahi for exploring Maui, as well as, the location of 28D in the complex! Mahalo! My family and I just returned home after a wonderful stay at Lynn and Sharon's condo. From the moment we arrived we were thrilled that we had found this fabulous piece of paradise! The location was perfect for us! Upon stepping in the home, we were floored by the awesome view! The large picture window was so nice, and we felt like this condo was special, as we didn't see that the others had this nice feature. We enjoyed many breakfasts and sunsets enjoying the lanai's (there were three, by the way) and it was my ritual to go running every morning and then eat my breakfast with a view. Heaven for sure! The beach was a very short walk and in my opinion, this condo is on the best stretch of beach on Maui. That is something that is very important to me, and this vacation rental exceeded by expectations! Close to shopping and would be easy to walk to one of the hotels close by for a nice dinner or cocktail. As for the condo, it was immaculate! I love the Hawaii tradition of no shoes in the house. The carpet felt so clean to me! We do this at home, so I really appreciate that. The condo has been completely updated and the kitchen was so lovely and functional. I loved the green dishes also. :) The bathrooms were so fabulous. We loved the showers and the nice Maui Soap Company soap that they left for us. The beds were so comfortable and the sheets and pillows were perfect. We all slept so well! I love that the owners left a big binder with things to do and restaurant recommendations . I thumbed through it a lot and we tried many of the things they suggested! What a great idea! We had such a great vacation and although our next trip probably won't be with our kids and won't need two bedrooms, we would still love to stay here. It was truly one of our favorite vacation spots. Thanks again Lynn and Sharon! It was a pleasure! Great view, quiet, comfortable, Wailea condo! We really loved our stay in 28D. The owners, Lynn and Sharon were very nice, and easy to work with. The pictures don't really do the condo justice, we thought it was cozier, and more luxurious than what the listing shows. The condo was very clean, and well-equipped. The kitchen had absolutely everything I needed, and there were little touches through out the condo that made it feel like a home. It is obvious that Lynn and Sharon love this place, and they have decorated it in a traditional Hawaiian style, with unique, nice artwork, some of which I think is by local artists. The furniture is comfortable, and the beds were excellent, with high quality, very clean linens. The owners leave a nice welcome gift, and had fancy hand-made Maui soap in the bathrooms. Everything in the condo was in good working order, including the AC, which we really needed in August. They also provide a very thorough notebook full of instructions about how everything works in the condo, and tons of recommendations for attractions and restaurants. The rental process was simple, and they answered every one of my many questions promptly. I was given a discount for paying with a personal check, rather than credit card. Normally I wouldn't mail a total stranger a check, but the vibe I got from both owners was so good, I made an exception, and I'm happy I did. The only improvements I would suggest would be to put longer twin beds in the second bedroom, and add a door from the toilet/shower area to the master bedroom. It is around the corner for privacy, but I still much prefer a door. I would definitely stay here again, and have already started recommending it to people. The Ekahi Village itself is much nicer than I though it would be. They have 3 small "quiet" pools, and a very nice main pool, right on the ocean, with private direct beach access. The bathrooms, dining areas, BBQ, fridge space, fresh drinking water, ice machine, kitchen, and loungers were all MUCH nicer than what I usually see at condo complexes. The grounds and facilities were clean, and well maintained, by polite, friendly staff. Amazing condo in an amazing location! My family and I just returned home after a wonderful stay at Lynn and Sharon's condo. From the moment we arrived we were thrilled that we had found this fabulous piece of paradise! The location was perfect for us! Upon stepping in the home, we were floored by the awesome view! The large picture window was so nice, and we felt like this condo was special, as we didn't see that the others had this nice feature. We enjoyed many breakfasts and sunsets enjoying the lanai's (there were three, by the way) and it was my ritual to go running every morning and then eat my breakfast with a view. Heaven for sure! The beach was a very short walk and in my opinion, this condo is on the best stretch of beach on Maui. That is something that is very important to me, and this vacation rental exceeded by expectations! Close to shopping and would be easy to walk to one of the hotels close by for a nice dinner or cocktail. As for the condo, it was immaculate! I love the Hawaii tradition of no shoes in the house. The carpet felt so clean to me! We do this at home, so I really appreciate that. The condo has been completely updated and the kitchen was so lovely and functional. I loved the green dishes also. :) The bathrooms were so fabulous. We loved the showers and the nice Maui Soap Company soap that they left for us. The beds were so comfortable and the sheets and pillows were perfect. We all slept so well! I love that the owners left a big binder with things to do and restaurant recommendations . I thumbed through it a lot and we tried many of the things they suggested! What a great idea! We had such a great vacation and although our next trip probably won't be with our kids and won't need two bedrooms, we would still love to stay here. It was truly one of our favorite vacation spots. Thanks again Lynn and Sharon! It was a pleasure! Wonderful Family Vacation My family very much enjoyed our stay in the Peabody's condo - mahalo! We love Ekahi Village and this is the best condo we've stayed at, by far. We were very comfortable and had everything we needed. The kitchen is amazing - I wish I had seen it before we remodeled ours. The entire condo is very well-appointed: lots of books, nature guides, towels, soaps. It had everything we needed. Special thanks for the beach supplies - chairs, umbrellas. There are wonderful views from the balconies. The beach is a short walk away. Some of the best snorkeling of our trip was off Ulua beach. The kids loved the pool by the ocean. We hope to return someday to revisit memories and create new ones. Thank you! What a great Maui condo Left on May 15, 2016 for a stay in May 2016 We just got back from staying in 28D and we found ourselves several times saying the condo was better than the website. The owners have done a great job outfitting the condo and it really does have an amazing view of the ocean. The owners were fantastic to work with and did a great job communicating with me. I would highly recommend this condo and can't wait to book our next trip. Beautiful condo in paradise! Left on Jan 25, 2016 for a stay in Dec 2015 This is our second time staying in this condo. This condo is clean, comfortable and quiet. The condo has everything you need including cookware, dishes, beach chairs, boogie boards, beach towels,and a Weber gas grill. The view and sunsets are amazing. It is overlooking a quiet pool, and a short walk to the beach. The owners are very responsive and easy to work with. We have already reserved this condo again for next year! This is so late but I didn't want to miss out on a chance to review Sharon and Lynn's condo. We were in Maui in august, but a number of issues confronting us at home made me delay this review. Everything that you could possibly need is in this place. The condo is beautifully decorated. You wake to ocean views and walk down the landscaped fruit and herb paths to get to the beach. The new cabinetry in the kitchen is nice appointed with all the amenities you would need to make and complete your meals (plates, pans, cutlery, trays measuring cups, spoons, cutting boards, etc. The refrigerator often has some leftover staples and spices which you may choose to use or not. There is a washer/dryer combo and two large bedrooms. The pictures don't do it justice. You can walk to the small pool immediately in front of the condo or you can get down to the beach pool area and access by taking the path down to the ocean pool. The large pool area has a nice kitchen area, with tables, chairs, ice maker!, stove! Steps from the beach. Stayed here w/wife,daughter and son-in-law,couldn't have been better! The owners were great to work with and we felt that they really cared about us have a great vacation. Many tips and ideas are there for you and literally everything you could want or need is there! The place itself was fabulous,in a great location and I would stay here again in a heartbeat! Our stay was excellent. Lynn and Sharon were fantastic to deal with as was their condo manager in Wailea. The view from the Condo is exactly as you see it on the web site. The condo has a great location - centrally located in Wailea; 30 minutes from the airport; close to a small quiet pool and only a short walk to the large pool and pavilion or to the fabulous beach. The grounds are meticulous. The condo was extremely well equipped. 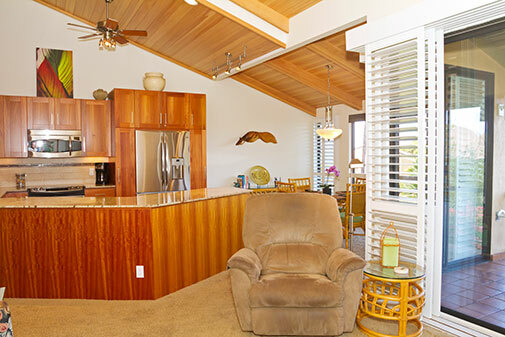 The kitchen had everything you could ask for; ample beach and pool toy supplies; great binoculars for whale watching right off our lanai; comfortable beds and furniture. We loved everything and can not think of a fault. We love this condo!! 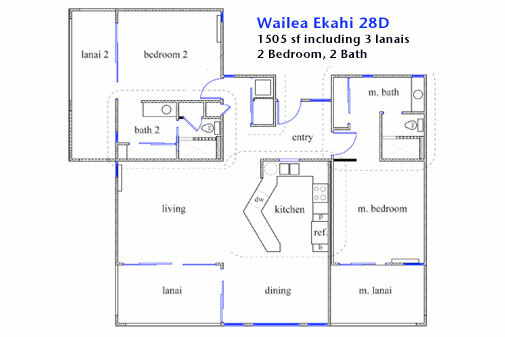 We recently stayed in Ekahi 28D for about 9 days. We have 2 young children (ages 5 and 8) and we had a wonderful time! Excellent access to the beach and pools, close to restaurants and other activities we participated in. The view is amazing and the condo is beautifully remodeled and looks fantastic!! We loved being able to head out for the first half of the day and then come back and be able to relax and stay cool with the breezes coming in off the ocean. Meals out on the Lanai were a definite plus as well! I highly recommend this condo for anyone who is looking for a getaway in Maui! We will definitely be back to this condo!! We enjoyed our stay at this condo. It is nicely furnished and the owners supplied amenities to make our beach time much more pleasant. They also supplied numerous books about the island and things to do including lesser known sites and hikes. The views were awesome and the trek to the beach took only a few minutes. We took our adult children and the condo was very quiet and very comfortable for all of us. We would stay here again when we return.